This station, under the direction of Arthur L. Smith, physics teacher at North Central High School, initially used a spark gap transmitter and used the call letters 7YL beginning before July 1921. Apparently, the students who belonged to the school's radio club experimented with radiotelephony as well as telegraphy. A license for this station was applied for and KFIO became an offical broadcast station on 22 May 1923. "The little station up at North Central High School had been off for three years. Charlie Smith (sic), who was the physics teacher up there wanted to get the thing back on the air; then after he got the license he did not know how to get it back on the air. He asked me if I would get the thing going for him, which I did." 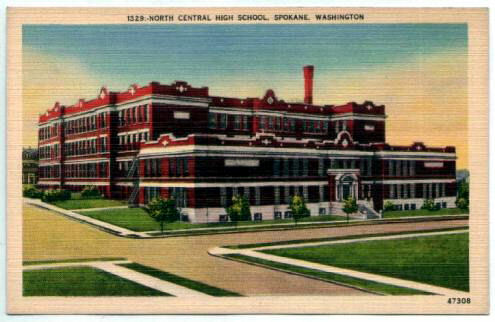 The station moved from the High School to Downtown Spokane in 1929. NOTE: Information about this station is scant. The author is looking for additional information about this station. Possibly there is something in archives at North Central High School. The Applicant's Description of Apparatus for KFIO's first license dated 10 March 1923 states that the transmitter was a 50-watt composite V.T. telephone transmitter. There were two 110-feet high towers for the antenna installed on the roof of the school. The horizontal part of the radiator was described as 168-feet long and the vertical part was described as 54-feet long. The wire for the radiator were spaced 3 feet apart. The wire was said to be No. 8 copper clad and 16/28 stranded braid. There was no direct ground connection, but there was a counterpoise which consisted of 5 wires 175-feet long. The wires were spaced 5 feet apart with a center lead-in. A hand-operated lightning protection 200-amp 600-volt switch was mounted on a window casing. D. Windsor Hunt, who was a student at North Central and a member of the radio club, provided a description of the station in 1927. Hunt related that the transmitter and studio were located in an 8-foot by 16-foot closet between the physics lab and a classroom on the south side of the building on the third floor. The antenna lead went to the roof and three counterpoise wires hung below the aerial. The transmitter took up a about 6-foot by 6-foot space and was about 100 watts. 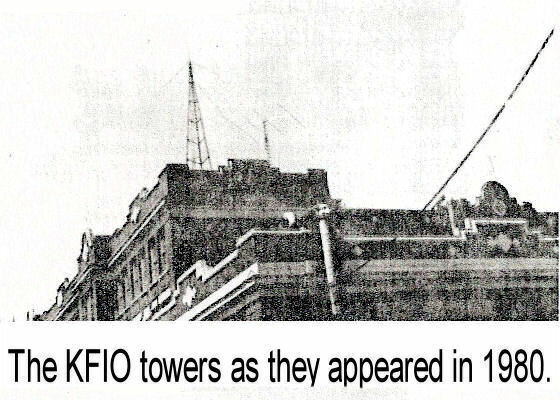 For a picture of the "flat top" antenna used by KFIO see below. This was a popular type of antenna that was popular in the early days of radio broadcasting. 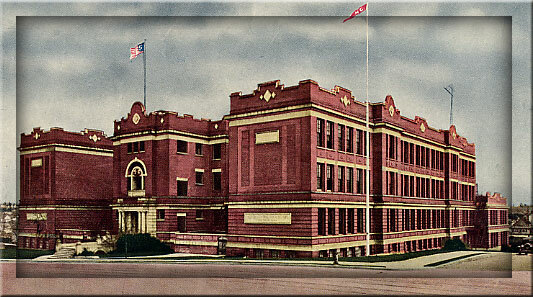 View of the north side of the school. You can see one of the towers at the rear of the building on the right hand side. This is a view of the south side of the building. However, neither of the towers are visible. Leonard Graham, NC Radio Club adviser, with Lynn Ross, Gary Watson, and Bob Leuven, atop North Central High School looking at one of the two Towers that was used by KFIO before 1930 and was used by the NC Radio Club through the 1970's. This photo was taken in 1980. It shows one of the tower (left) and another antenna, probably related to the school's ham radio club on the right. This is reportedly a picture of the transmitter room. 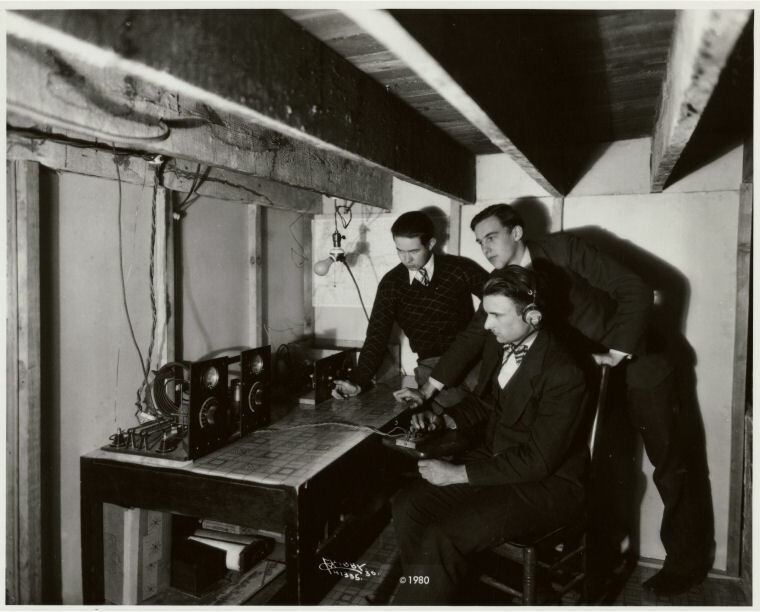 The picture was dated 1930 and the young men were using telegraph key. So confirmation is needed. 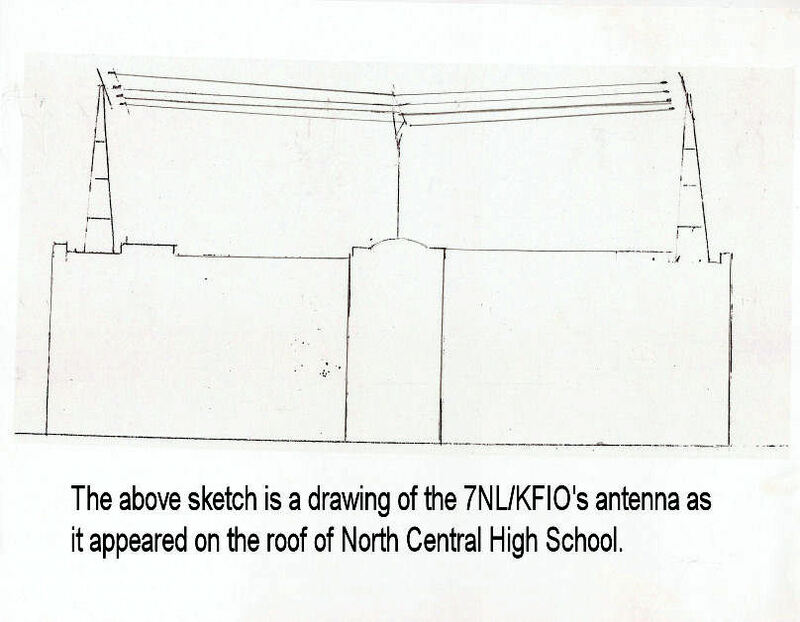 Sketch of the antenna. This is a "flat top" antenna. Craney, Edmund. Interviewed by Hugh Rundell in 1977. Washington State Association Broadcasters Oral History Project. Olympia, Washington. Used by permission. Department of Commerce's Radio Service Bulletin. Washington, DC. 1 July 1921. Hunt, D. Windsor. "Early Days of KFIO." In Early Days of Spokane Broadcasting. Spokane, Washington. About 1981. Jorgenson, Thorwald and Partlow, Carl. Early Days of Spokane Broadacasting. Spokane, Washington. About 1980. KFIO. Applicant's Description of Apparatus. Radio Service, Bureau of Navigation, Department of Commerce. Washington, DC. 1923 to 1927. Photocopied from original records at National Archives, College Park, Maryland. 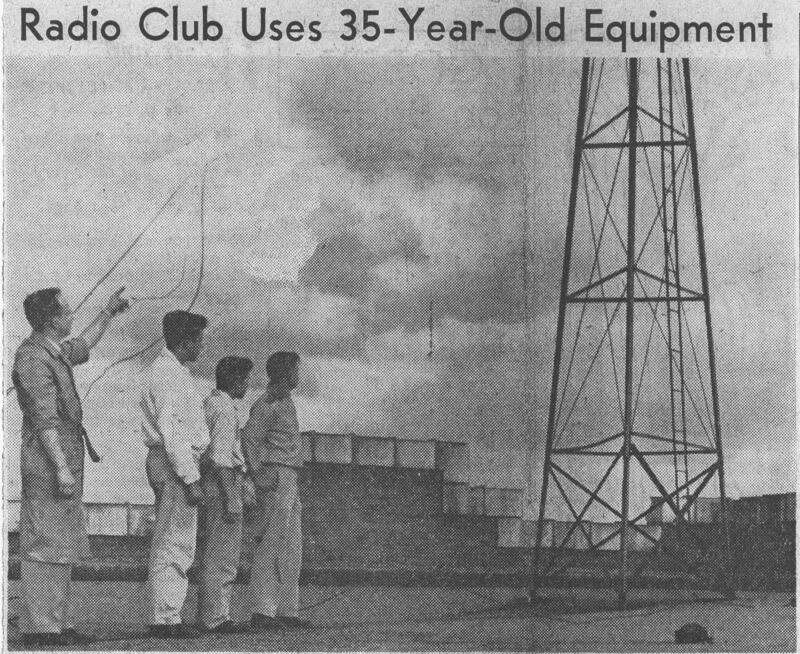 "Radio Club Uses 35-Year Old Eqipment." Spokane Chronicle. Spokane, Washington. 25 November 1955. Page 3. Taylor, Charles. Information about transmitting facility. Email correspondance. 23 May 2007.